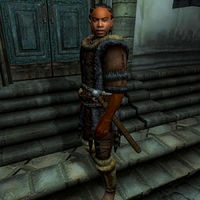 Rhano, a Redguard barbarian, is a Swordsman of the Anvil Fighters Guild. He is an advanced trainer in Blade, but will only offer his services to fellow guildmates. As a higher ranking member in one of the main Fighters Guild Halls, he is very dedicated to keep improving his combat skills in his daily routine. He can be found sleeping in the company of his fellow guildmates in the ground floor of the Guild Hall from 2am to 8am every day, and once he wakes up he will locate in his favorite spot near the stairs that lead to the second floor, where he will rest for a brief moment while offering training to any fellow Fighters Guild member. Once the clock strikes 10am, Rhano will pull out his sword to practice with the training dummy that he conveniently has nearby until 2pm, when he will depart towards The Flowing Bowl to have his breakfast during two hours. After he feels satisfied, he will return to the Guild Hall at 4pm to locate in his favorite spot once again, where he will have a brief moment of peace before his dinnertime at 8pm. After he has had his two-hours dinner, Rhano will decide to take a stroll around the building, until he finally crawls to his bed to sleep at 2am. Rhano's limited services will be available at any time of the day, except when he takes his breaks to sleep or eat. While awake, Rhano wears a fur cuirass, greaves and boots; however once the night arrives he switches to his second outift, which consists of a set of lower-class clothing. He is armed with an iron shortsword and also carries a medium-sized amount of gold. The townsfolk of Anvil have noticed the skilled swordsman. When asked for rumors, they might tell you: "Rhano is quite the swordsman. I've heard he'll train you for the right amount of money." and "Have you seen Rhano at the Fighters Guild use his sword? Impressive. He could teach us all a thing or two." Upon first meeting him, he will present himself and his trade: "Rhano. I'm Anvil's Advanced Trainer in Blade Weapons." When asked about town he will share a secret with you: "I worry sometimes I'll go soft here, training mostly, and living easy. So now and then I go out along the coast on my own, just to stay in shape." As an advanced trainer, Rhano can provide you the necessary reference to start the master tranining quest. Once you have achieved a Blade skill of 70, speak to him about "Training", to which he will respond:"I certainly can't teach you anything more. But if the rumors are true, and Alix Lencolia is passing through Cyrodiil, he might be able to teach you. He'll be truly famous one day. Word already spreads about his skill... I think someone saw him at Faregyl Inn not too long ago. You should try there."